So day one was easy because most of the creating I did was for the blog site. Day two however, posed a challenge. Cthulhu boards might be dry enough to paint, but they are currently at Ryan’s house. If I can manage to get some time with Cthulhu later, today might even merit a second update. My newest ideas are all inspired by the fact that when Ryan and I move out we will have empty walls. 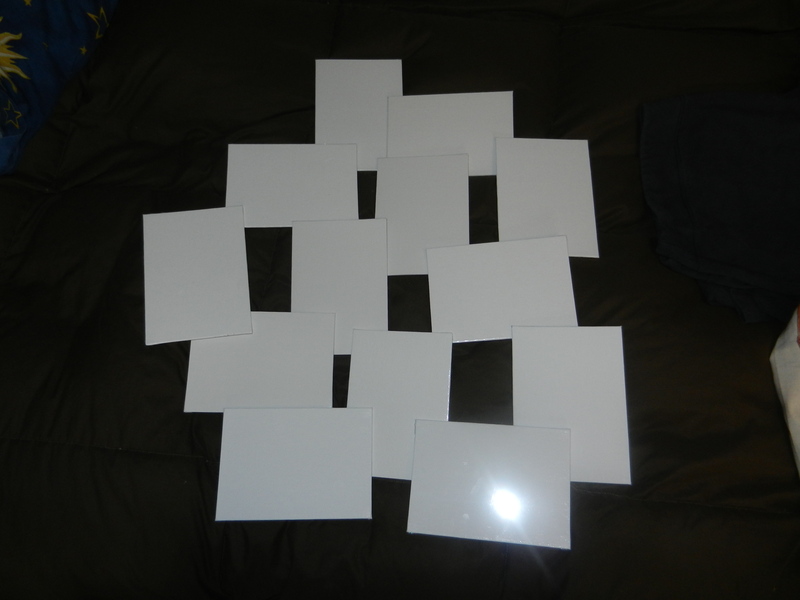 I bought a pack of 15 pre-prepped canvases (4″x6″). They are small, but I think that will help things seem less intimidating. I want to paint each canvas with a nerdy thing and then attach all the canvases like one of those collage picture frames. I need ideas of nerdy things to paint on the canvases. Ideas thus far include: D20, Portal gun, Horde symbol, Rebel Alliance symbol, Millennium Falcon…..but I need more ideas. suggestions welcome.